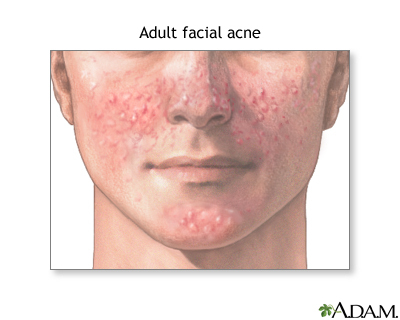 Acne may persist into adulthood. Updated by: Kevin Berman, MD, PhD, Atlanta Center for Dermatologic Disease, Atlanta, GA. Review provided by VeriMed Healthcare Network. Also reviewed by A.D.A.M. Health Solutions, Ebix, Inc., Editorial Team: David Zieve, MD, MHA, David R. Eltz, Stephanie Slon, and Nissi Wang.